This page contains previous items from our Latest News feature. Primatech is exhibiting at this year’s GCPS, March 31-April 3, 2019 in New Orleans, Louisiana. Be sure to visit our booth (#204) during exhibit hours at the Hilton New Orleans Riverside. Staff members Steven Baybutt, Shawn Metzler, Kim Carnahan, Angie Davidson, and Steve Funk will be available to discuss how Primatech's software, consulting, training, and certifications can assist in meeting your organization's process safety needs. You will be able to view and demo our newest software, PHAWorks RA Edition and PHAWorks Lite at the Primatech booth. We’re offering special software discounts – $1,000 Discount for PHAWorks RA Edition; and, $500 Discount for PHAWorks Lite – see Primatech staff at the booth for details. We will be giving away another exciting prize this year. Be sure to come by the booth and drop off your business card for a chance to win! See additional information about Primatech at this year's GCPS. On February 19, 2019, the US Chemical Safety Board (CSB) issued its final report on the series of explosions that occurred at the Enterprise Products Gas Plant in Pascagoula, Mississippi, on June 27, 2016. The plant was shut down for nearly six months as a result of the incident. The CSB concluded that thermal fatigue likely caused a failure of a brazed aluminum heat exchanger (BAHX). Loss of containment in the heat exchanger resulted in the release of a mixture of methane, ethane, propane, and other hydrocarbons. The hydrocarbons ignited, initiating a series of fires and explosions. According to the CSB, process data indicated that the plant’s BAHXs were repeatedly subjected to temperature changes that exceeded industry-recommended practices. This caused the aluminum parts in the heat exchanger to expand and contract disproportionately, which weakened the metal, causing cracks, which led to release of the hydrocarbons. Based on this incident, and BAHX failures at other facilities, the CSB stated that midstream gas plant operators need a more robust assessment and risk management plan that considers thermal fatigue to help prevent catastrophic failures of BAHXs. The CSB concluded that more realistic and updated guidance is needed to improve the safe use of BAHXs. The CSB is issuing recommendations to the American Petroleum Institute (API) and the GPA Midstream Association to share information related to failure hazards of BAHXs from thermal fatigue. Also, in the area of emergency response, the CSB is recommending a more robust and engaged community alert network that includes social media and the ability to expand opportunities to interact with the community throughout an incident. Read the CSB news release. Read the CSB final report. View the CSB’s 3D animation of the incident. The U.S. Environmental Protection Agency (EPA) announced on December 3, 2018 that the amendments to the Risk Management Program put forward in a final rule published in the Federal Register on January 13, 2017 are now effective. The effective date of the amendments was delayed three times before a court mandate was issued which made the amendments effective. More information about the amendments to the RMP rule is available at EPA RMP Rule Amendments. For access to the Federal Register announcement, click here. Primatech has issued this white paper to help practitioners address recommendations in PHA studies. You may view the white paper by clicking here. On October 24th, 2018, the US Chemical Safety Board (CSB) issued a “Call to Action: Combustible Dust Hazards” in an effort to collect comments on the management and control of combustible dusts at facilities where dust-related hazards are present. The Call to Action is a part of the CSB’s ongoing investigation into the May 2017 Didion Mill explosion. CSB is seeking comments from companies, regulators, inspectors, safety training providers, researchers, unions, and workers affected by dust-related hazards. The CSB issued a report on dust explosions in 2006 that identified 281 major incidents that had occurred from 1980 to 2005 killing 119 people and injuring 718 more. In 2006, the CSB asked OSHA to release a standard on combustible dust, and has made three subsequent additional recommendations. The CSB is aware of a further 105 combustible-dust-related incidents that occurred from 2006 to 2017 resulting in 59 fatalities and 303 injuries. A Combustible Dust Advanced Notice of Public Rulemaking was published by OSHA in the Federal Register on October 21, 2009 but no further action on a standard has been taken. CSB investigations found that one of the main similarities of combustible dust-related incidents is that the people working in those facilities had the perception that the dust was normal and maintained at a “safe” level. CSB is seeking input on many combustible dust hazard issues, including recognizing and measuring unsafe levels of dust in the workplace and methods for communicating the low-frequency but high-consequence hazards of combustible dusts to those overseeing the work environment. A full list of the questions contained in the Call To Action can be found here. Comments can be emailed to CSB at combustibledust@csb.gov until November 26, 2018. 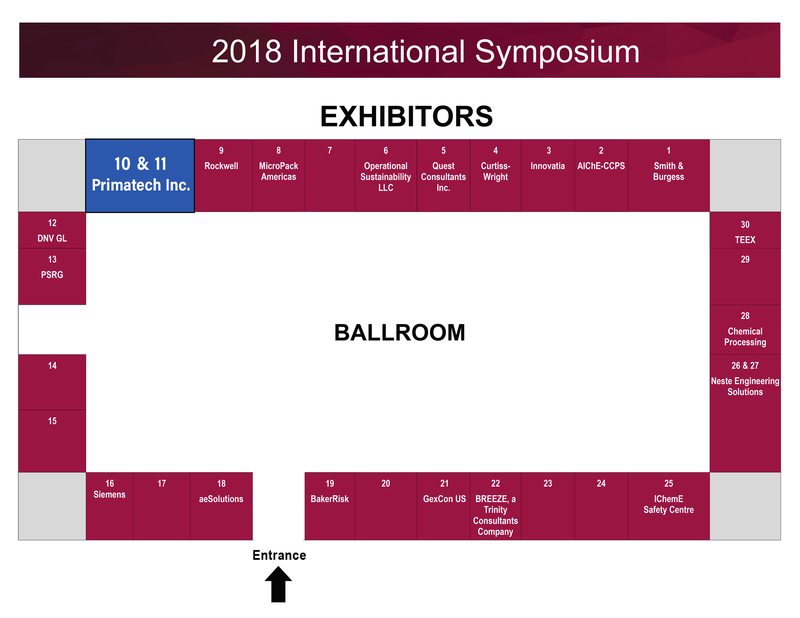 Primatech will be exhibiting at the annual Mary Kay O’Connor Process Safety Center International Symposium, October 23-25, 2018 in College Station, Texas. Be sure to visit the Primatech booth (10 & 11) at the Hilton Conference Center’s Bluebonnet Ballroom exhibit hall, where we will be featuring demos of our newest software, highlighted by hands-on demonstrations of PHAWorks RA Edition and PHAWorks Lite. Representing Primatech will be Shawn Metzler, who will be available to discuss how Primatech's consulting, training, and software and Primacert’s certifications can assist in meeting your organization's process safety objectives. The Primatech booth will also feature copies of recent technical papers that you can pick up. Written by company founder and CEO, Dr. Paul Baybutt, topics of these articles include: documenting PHA scenarios correctly; key issues in performing HAZOP studies; and, using LOPA to determine SILs. While visiting the Primatech booth, be sure to drop off your business card for a chance to win a Bose SoundLink Mini II Bluetooth Wireless Speaker! See additional information about Primatech exhibiting at this year’s Symposium. The newest edition of IEC 61511, Functional safety - Safety instrumented systems for the process industry sector, has been approved by ISA as a new version of ISA 84, Instrumented Systems to Achieve Functional Safety in the Process Industries. ISA developed the original ISA-84.01 standard on which the first edition of IEC 61511 was based. This new edition of IEC 61511 was approved by ISA without modification. The new standards will be designated as ANSI/ISA-61511, Functional Safety – Safety Instrumented Systems for the Process Industry Sector, Parts 1-3. The standards establish requirements for the specification, design, installation, operation and maintenance of safety instrumented systems. Sam Mannan, the founding director of the Mary Kay O'Connor Process Safety Center and Regents Professor of Chemical Engineering at Texas A&M University has passed away at the age of 63. Primatech and I extend our condolences to his family, friends, and colleagues. I first met Sam when he worked at RMT, an environmental consulting firm, having previously worked in academia. Subsequently, he moved back into academia when he became the director of the Mary Kay O'Connor Process Safety Center. Sam was one of the few people in the field who looked at process safety from both an academic and an industry perspective. Sam established the Mary Kay O'Connor Process Safety Center as a major center for process safety development with many graduate students and visiting professors over the years and an annual conference. He received many awards for his work. I recall dining with Sam in Qingdao, China during a process safety conference. He was concerned about the future of process safety and the need to bring young minds into the field. I am sure Sam would have continued pursuing this goal had his life not ended so soon. He will be missed by many. President, CEO, and founder, Primatech Inc.
Primatech has prepared this white paper to assist practitioners in understanding the correct way of conducting HAZOP studies. The document focuses on how to identify key aspects of design intent, generate important deviations, and use guidewords properly. The paper was published in the Journal of Loss Prevention in the Process Industries, Volume 55, pages 492-499, September 2018. The article can be accessed for free on Science Direct until September 26, 2018 by clicking on the link below. No sign up or registration is needed. Process hazard analysis is used to identify hazard scenarios so that the adequacy of process safeguards in protecting against incidents can be addressed. Of course, it is unlikely that this objective can be achieved with an incomplete set of scenarios. Also, scenarios from PHA are used as the basis for risk analysis studies such as LOPA and QRA which depend on having a complete set of scenarios to avoid underestimation of risk. Consequently, PHA studies should strive to identify hazard scenarios as completely as possible. The completeness of scenario identification is the most important issue for PHA. Missed scenarios can equate to the occurrence of incidents. The ability to achieve the identification of a complete set of hazard scenarios is limited by a number of factors. They include technical constraints posed by PHA methods and practices, human behaviors during PHA study sessions, and poor quality assurance and control in conducting studies. The latter arises from both external factors that adversely impact PHA team performance and internal factors that detract from the effectiveness of studies. This article identifies and discusses these factors and makes recommendations on how they can best be managed.